James Clapper, the former Director of National Intelligence, spoke about Russian meddling in the 2016 election at Jack Morton Auditorium Monday night. Former Director of National Intelligence James Clapper spoke at Jack Morton Auditorium Monday about Russian meddling in the 2016 presidential election and the future of cybersecurity. The event, titled “Digital Technology and the Attack on Democratic Norms,” was a joint effort between the Elliott School of International Affairs, the School of Media and Public Affairs and the Carr Center for Human Rights at Harvard University’s Kennedy School of Government. The event was moderated by David Ensor, director of GW’s Project for Media and National Security and the former director of Voice of America. Clapper said the poisoning of former Russian intelligence officer Sergei Skripal and his daughter Yulia in Salisbury, England, last month was the result of Russian President Vladimir Putin’s powerful animus toward the West, both personally and institutionally. “It was done intentionally. No big decisions are made in Russia without, if not the direct stamp, certainly the acquiescence of Putin,” he said. Clapper said the poisoning, which authorities say was carried out by the Russian government with a powerful nerve agent, may have been intended not only as a warning to Western nations of Russia’s capabilities but also to those who have defected from Russia or are considering defecting. He said the U.S. decision to expel 60 Russian diplomats and close a Russian consulate in response to the poisoning, a move made in solidarity with the United Kingdom and other Western allies, was a meaningful statement. Clapper said that the recent scandal surrounding Cambridge Analytica, a political consulting firm hired by the Trump campaign that acquired Facebook data on millions of users, cemented his stance that social media platforms needed to be regulated. The widespread reach of social media outlets, Clapper said, meant that Russian interference on those platforms could have swung the 2016 presidential election, but intelligence agencies are not able to make that determination. He added that Russian interference efforts extended beyond social media and into cable television, where coverage on the Kremlin-funded news station station RT also attempted to sway the vote. “I wouldn’t want to lose sight of the tremendous effort they made on RT, which has a substantial following in this country, more so than you would think from the other cable news networks,” he said. 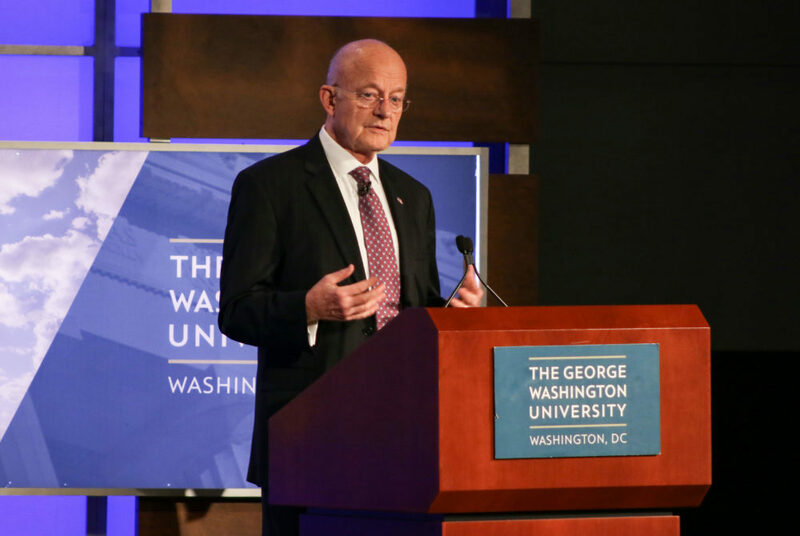 Clapper said he and other officials in the intelligence community view the counter-interference efforts undertaken at the end of the Obama administration, including closing Russian facilities in the U.S. and implementing new sanctions, as the first step in the struggle to maintain privacy online and safeguard U.S. elections. He said there would be no “silver bullet” to secure the United States from cybersecurity vulnerabilities and future hacking efforts. “There’s no Nirvana here. There’s just a lot of things we need to do with sharing, with hygiene, with better intelligence and, as well, everyone taking personal and institutional responsibility for doing the right thing here,” he said. Clapper ended his comments by saying it was his job, after having achieved “intelligence geezer-dom,” to try to enlist people for public service to strengthen the U.S. intelligence community.